According to Gary Yoshino, who wrote, "Japanese Cloisonné Enamels," "Totai Shippo" is the broad descriptive term for cloisonné on ceramics, earthenwares, and porcelain. 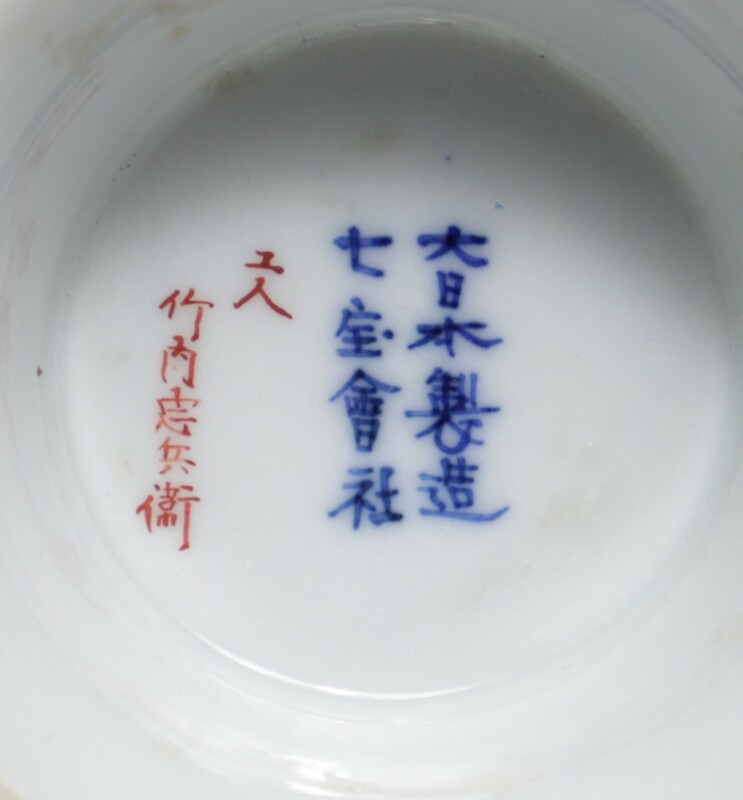 It has the appearance of metallic cloisonné ware, however some parts of the surface might be left decorated as normal blue an white porcelain. The renaissance of Japanese cloisonné manufacture is credited to the former samurai, Kaji Tsunekichi (1803-1883) of Nagoya in Owari Province (modern Aichi Prefecture) who rediscovered the art around 1835. Around 1850 he was confident enough to take on students. One of these was Hayashi Shogoro (d.1896), a craftsman sadly enough mostly celebrated for the fact that his pupils in their turn became the teachers of many of the later masters of cloisonné enamelling. Of these, the most important was Sukamoto Kaisuke (1828-1887). Sukamoto Kaisuke (1828-1887) is believed to have been the one who discovered, some time around 1868, the technique of applying cloisonné enamels to ceramic vessels. The innovation was relatively short-lived. 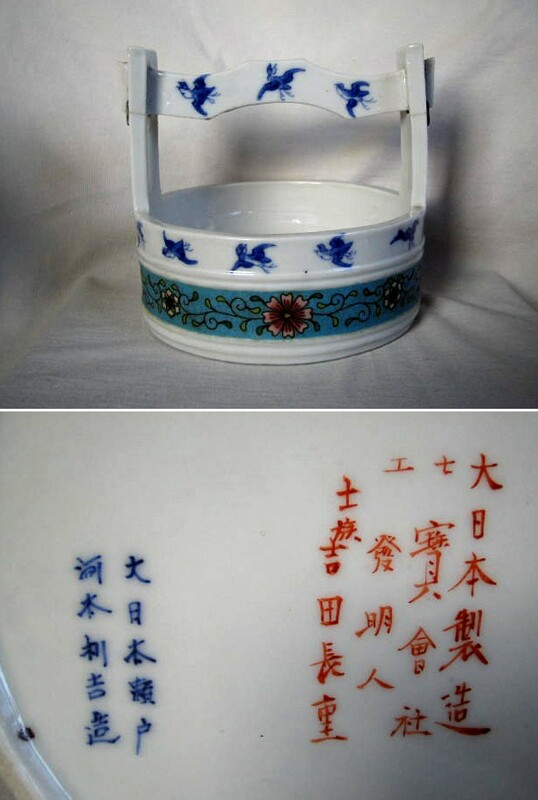 Similar ware but with inlaid silver wires on porcelain is called jiki shippo. Introductory text written by and together with several expert members of the Gotheborg Discussion Board. Takeuchi Chubei was one of the most prolific artists associated with Shippo-Gaisha who produced totai shippo pieces, typically on fine white porcelain bodies. Most examples bear a detailed mark on the base inscribed in dark blue or red enamel. 1574. Vases. Mark: Dai Nippon Sei Zo, Shippo Gai Sha (Great Japan, cloisonné manufacturing company), Ko Jin (personally made) Takeuchi Chubei, 994. 1575. Vases. Seto ware with Totai Shippo decoration. Due to proximity between Nagoya and Seto, a large proportion of the porcealin was used appears to have come from Seto. Some pieces have marks from both Seto, in underglaze blue, as well as from the cloissoné artist, in iron red.